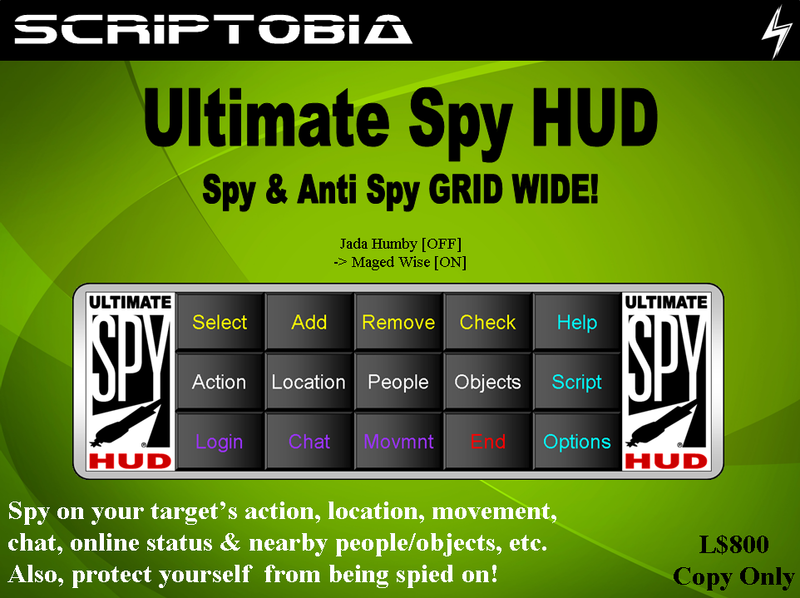 The Ultimate Spy HUD gives you the most modern and innovative spying and anti-spying features in SL in a very easy to use tool. The HUD gives you multiple ways to spy on your targets in SL to help you figure out what they are saying or doing. It also supports both local (same sim) and remote (Grid wise) spying modes to suit a variety of purposes. It also protects you with effective anti-spying features. All the scripting has been optimized for MONO! Local (Sim) Spying: in this mode you can spy on targets in the same sim, however distant they are from you (some features require you to have script/build permissions on the path between you and the target). Remote (Grid-wide) Spying: in this mode you can spy on targets wherever they are in the SL grid provided you give them a gift to wear. The tool allows you to convert any attachment (prim clothes, hat, watch, AO, HUD) into a discrete spy bug. As long as they wear it, you can spy on them any where (even in no-permission parcels). Manage targets: provides Add, Remove and Select (active) target buttons. The Add button allows you to add a target from the current region or by saying its full name on a private channel. The Remove button allows you remove a previously added target. The Select buttons allows you to make one of the added targets the active one. Check targets: allows you to check whether you can spy on given targets based on whether they are wearing the spy bugs or located in the same sim. Spy on online status: allows you to see and get notified (with sound and IM) when your targets go online or offline. Spy on action: allows you to know what your target is doing at the moment (standing, walking, running, flying, sitting, etc.). For example, sitting may indicate dancing or other intimate activities when coupled with a close distance (<1m) to another person. Spy on location: allows you to know the whereabouts of your target. This includes the exact coordinates grid wide (i.e., the region name and coordinates), the name of the parcel, the owner of the parcel, the area of the parcel, the flags of the parcel (scripts allowed, build allowed, etc.) and the media URI of the parcel (that they may be listening to). The location of a person is given as a link in chat that you can use to teleport to that person’s location (to catch them on the act for example!). Spy on people: allows you to know the people around your target, what they are doing and how far they are from them. This can be combined with other clues to know what your target is doing (for example, a close by person who is also sitting like your target can indicate dancing or intimate activities). Spy on objects: allows you to know the immediate objects around your target and how far they are from them. This can give you a better understanding of the surrounding of your target. For example, in a club most of the objects returned will be dance balls, where in a shop most of them will be vendors. Spy on chat: allows you to enable/disable the continuous spying on public chat around your target . When enabled, all the chat around your target will be relayed to you via IM even when you are offline. Spy on movement: allows you to enable/disable continuous spying on the movement of your target. When enabled, and unlike other spy solutions that spam you with the target location every few seconds, it will notify you only after the avatar completes a move. This creates much less spam and gives more meaningful report, even when you are offline. Spy on bug: allows you to enable/disable the continuous spying on your target’s wearing or taking off of the spy bug. Proximity alert: notifies you with IM and sounds of other people entering or leaving your hearing range. The alert is active only when you are not moving making it both efficient and non- spammy. Bug scan: notifies you of any candidate spy bug near you by detecting active objects that belong to others that enter or leave your hearing range. The scan occurs only when you are not moving to be more efficient and non-spammy. * The HUD is very easy and intuitive to use with buttons and menus only (no messy notecards!). * The HUD is very light-weight on sim resources (minimal prims and scripts). * The HUD is non-intrusive and can collapse to a small logo when not used. * The HUD gives a help notecard with a summary of the commands. * The HUD gives the spy bug script to put into gift attachments. * The HUD allows controlling some settings for IM and sounds. Scriptobia does not condone irresponsible behavior or one that is in violation of the SL TOS. Use this tool responsibly and at your own risk! Hi, Can you tell me how to use the grid-wide spying mode. I understand that it has to be used on an item that the person is wearing, but how easy is it to add the spy script to the item/s? Do you provide items already scripted for this? It is very easy to setup an item with the bug script. You basically need an attachment (clothing, hair, AO, etc.) that you have at least mod/trans rights to. You rez it, edit its contents, and drop the script in it (that’s why you need mod right). Then you pick it up and send it to your target to wear (that’s why you need trans right). I don’t provide items already loaded with the script, but if you see any item I provide that would be a good gift to your target, I would gladly put the script there for you.